Last week the Art Department was pleased to welcome back Dr. Jasmine (Fry) Cloud, who completed her Bachelor’s Degree in Art History at Truman in 2005. After Truman, she earned her Master’s in Art History from the University of Colorado at Boulder, and her PhD from Temple University in 2014. Currently an Assistant Professor at the University of Central Missouri, Dr. Cloud has published her research in Reflections on Renaissance Venice, Perspectives on Public Space in Rome, from Antiquity to the Present Days, and Venice in the Renaissance: Essays in Honor of Patricia Fortini Brown. Dr. Cloud was the recipient of the Samuel H. Kress Foundation’s Institutional Fellowship which included a residency at the Bibliotheca Hertziana in Rome. While at Truman, Dr. Cloud gave a public talk on her research in Early Modern Rome, as well as meeting with members of the Art History Society (of which she was an active member during her undergraduate years) and the juniors in our Historical Methods seminar class. Her visit was funded by an Alumni Visit Grant from the School of Arts and Letters. 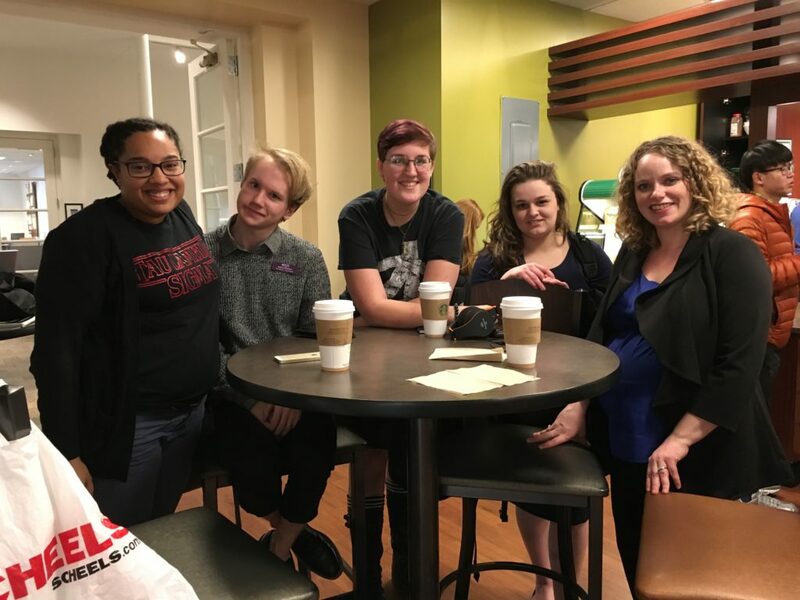 Jasmine Cloud (at right) meets with Art History students in the library coffee shop.